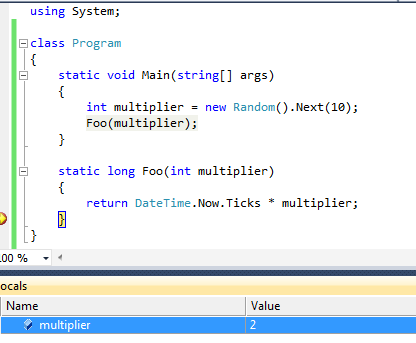 showing C# method return in debugger – VB.NET can do it! 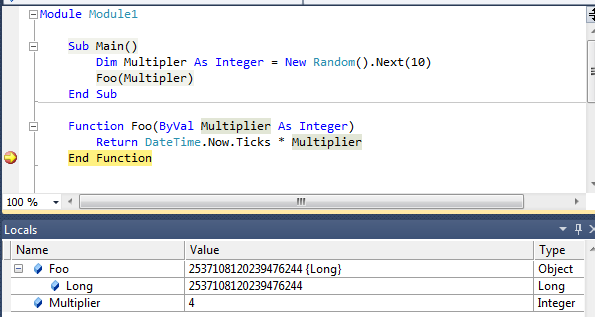 Last time I mentioned that I’d like the ability for the C# debugger to show the return value from a method. One thing that some threads on the subject in various places (including StackOverflow) seem to argue is that the CLR doesn’t support this, so the C# debugger can’t do it. Unfortunately cluttering your code with temporary variables in the only way in managed code (C# or VB). The CLR has no support for "managed return values" in the debugger and hence VS does not either. Since it’s a very simple test to show this to be false (at least in 2010 / .NET 4), I figured I’d include it in a post. For this exercise, I’m using Visual Basic 2010 Express and Visual C# 2010 Express so anyone else should be able to reproduce this (for free) themselves. In trying to keep the example simple, I just picked a method that would return something that would obviously change from call to call and couldn’t be pre-calculated (so the value being shown couldn’t be something from a different/separate call). The key screen shot is setting a breakpoint on the ‘end function’ line and looking at the Locals window. With VB.NET, the function name shows up as an entry in ‘Locals’ and the debugger shows us the value it’s returning! So, clearly the CLR has enough support for the VB.NET debugger to support this feature, which would seem to be a pretty strong argument that the C# debugger certainly could implement this feature.